*** Mikerocosmos is the illustrated, 6-by-9-inch 144-page trade paperback collecting many of Guest of Honor Mike Resnick’s ERB fan writings, that will be given free to those who register for this year’s Dum-Dum. 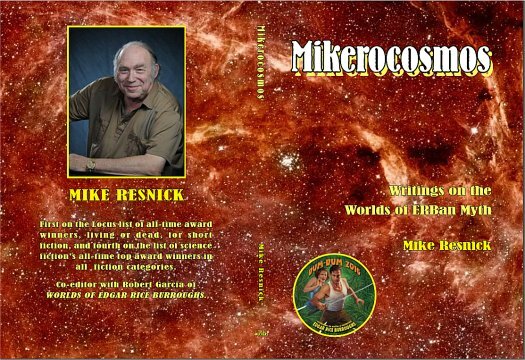 The collection includes Mike's Hugo-nominated story “A Princess of Earth”; a story where Tarzan meets one of Mike's favorite characters, Lucifer Jones; and articles from Burroughs' fanzines, ERBdom and ERBapa. 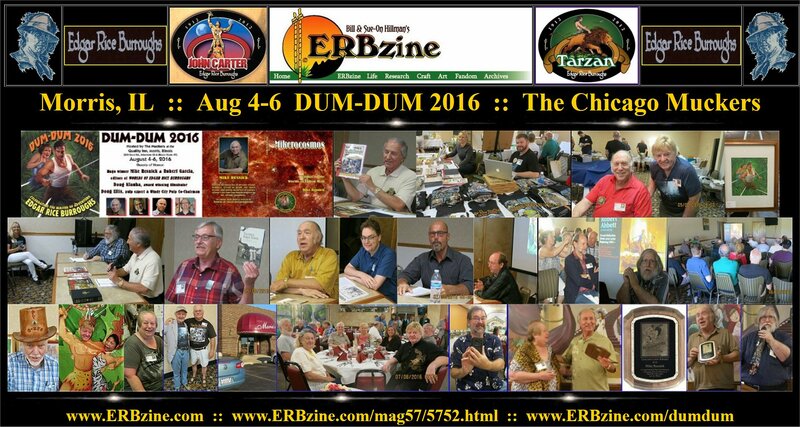 *** Our second guest of honor, Robert Garcia, recently announced he had designed the interior of the updated “Edgar Rice Burroughs: The Bibliography” by Robert B. Zeuschner. 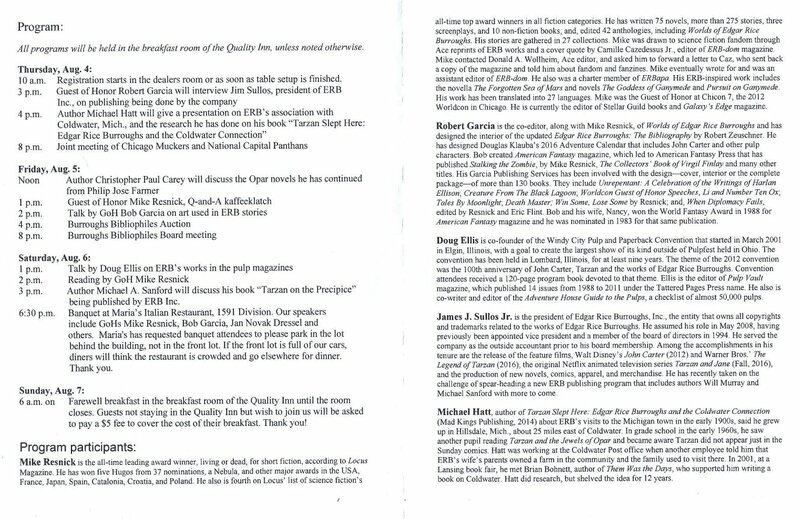 * 3 p.m.: Author Michael A. Sanford discussed his book “Tarzan on the Precipice” being published by ERB Inc.
* 6 a.m. and on: Farewell breakfast in the breakfast room of the Quality Inn. Registration was held inside the dealers room, the Ashford, Berkley and Carlisle rooms, during dealers room hours. 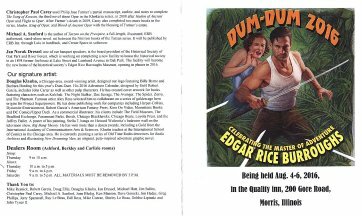 Help the Chicago Muckers chapter of the Burroughs Bibliophiles celebrate its 10th anniversary at the 2016 Dum-Dum, being held Thursday through Saturday, August 4 to 6, with a farewell breakfast Sunday, August 7, in Morris, Illinois. 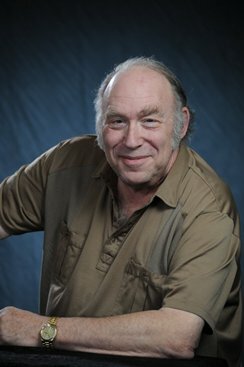 Our guests of honor will be Mike Resnick, Hugo-Award winning science fiction author, former ERB fandom writer, and co-editor of Worlds of Edgar Rice Burroughs; and Robert Garcia, his co-editor and the book’s graphic designer. Be sure to bring your copies and get them autographed. 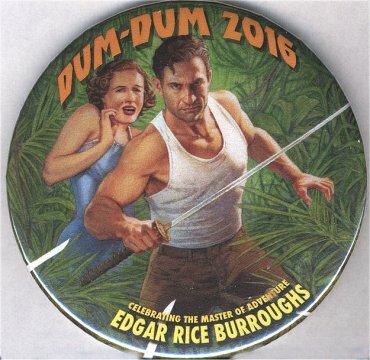 In keeping with the Muckers’ tradition, each registered Dum-Dum attendee will receive a book containing, in part, a number of Mike Resnick’s early ERB fan writings. 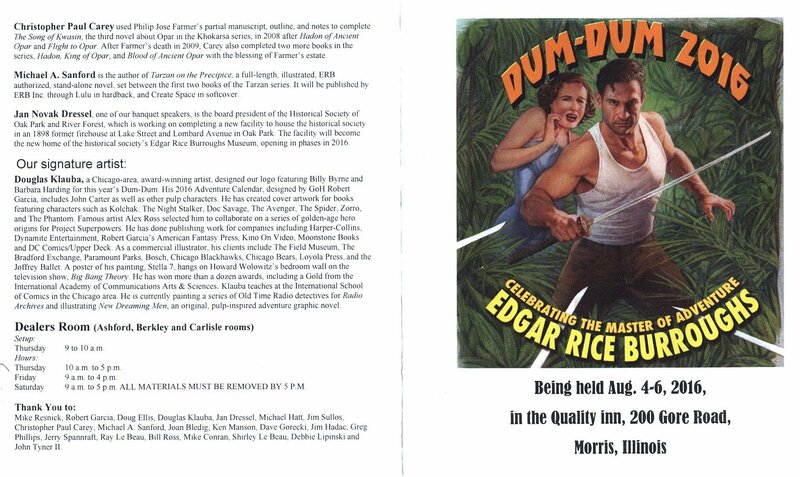 At the 2013 ECOF Gathering in Morris each registered attendee received a copy of The Best of the Muckers, and in 2010 the freebie was a profusely illustrated hardcover combination edition of The Mucker and The Return of the Mucker with cover art by Tom Floyd. Chicago-area, award-winning artist Douglas Klauba is our signature artist. 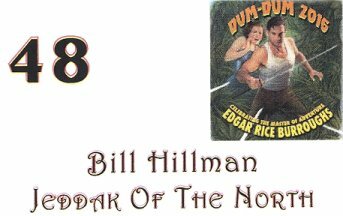 He is designing this year’s Dum-Dum logo. 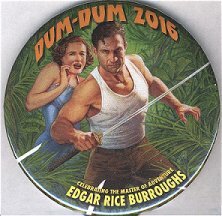 His 2016 Adventure Calendar, designed by GOH Bob Garcia, includes John Carter as well as other pulp characters. 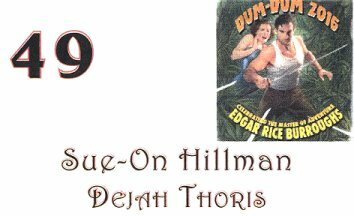 Doug will be happy to take commissions to personalize your souvenir book or other. Both guests will participate in programs. 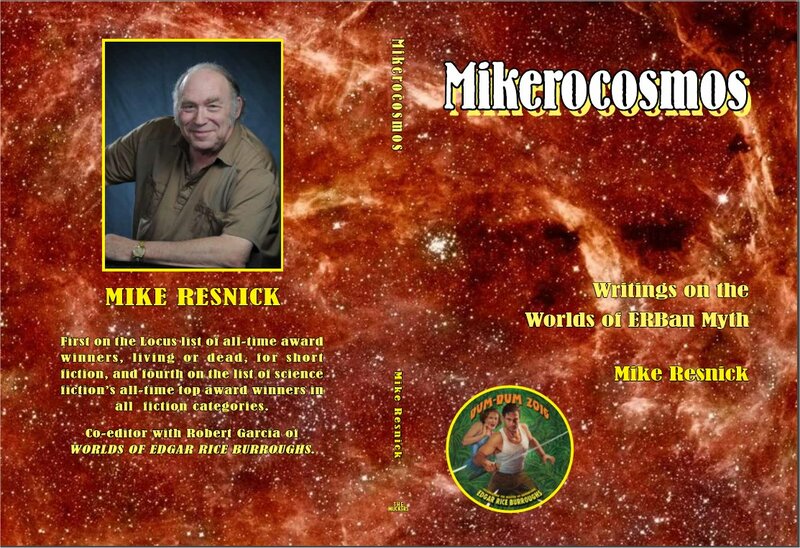 Mike Resnick will hold a Q-and-A kaffeeklatch on Friday afternoon, and a reading on Saturday. Bob Garcia will host a panel on art used in ERB stories. A program about Edgar Rice Burroughs’ works in the pulp magazines will be presented by pulp expert Doug Ellis, co-chairman of the Windy City Pulp and Paper Convention. A joint meeting of the Muckers and National Capital Panthans will be held Thursday night. The Burroughs Bibliophiles Board will meet Friday evening. The auction will be held 4 p.m. Friday afternoon. Other programs may be scheduled. 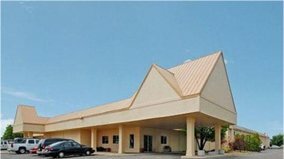 Our Saturday night banquet attendance will be at Maria’s Italian restaurant, a short drive south of the hotel on Illinois Route 47. Mike Resnick and Bob Garcia will be among our speakers. The farewell breakfast will be Sunday morning in the breakfast room of the hotel. Those who choose to stay elsewhere will be asked to pay a minimal cost to the Quality Inn for the farewell breakfast. Setup of the dealers’ rooms is expected from 9 to 10 a.m. Thursday. The room will be open until 5 p.m. that day for selling and from 9 a.m. to 4 p.m. Friday (closing a bit early to allow for the auction), then will open Saturday at 9 a.m. All dealer materials must be removed from the room by 5 p.m. on Saturday. Thirty-six tables will be available. Because the hotel has to rent tables from an outside source, regrettably we have to pass on that fee on to our dealers. Be sure to indicate whether you need a table. The hotel does not have drapery for the tables, so we recommend dealers bring a bottom cloth if they wish to cover their table’s surface plus a top cover for when the room closes or the table is left unattended. 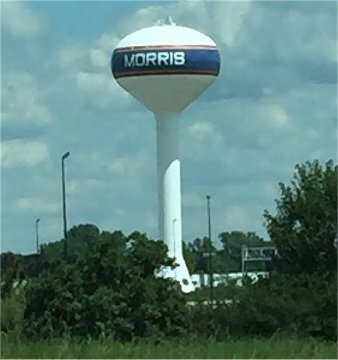 Morris, Illinois at the junction of Interstate 80 and Illinois Route 47 (about 60 miles southwest of O’Hare Airport). Our special convention rate is $99.99 per night plus tax. The hotel will extend the convention rate to folks who plan to check in Wednesday and/or check out Monday morning. Included in your stay is a free guest breakfast that is more than just a Continental breakfast, with at least one prepared hot dish. A block of 20 rooms is being held until July 4, so don’t wait until the last minute to book your room. The hotel telephone number is (815) 942-6600. 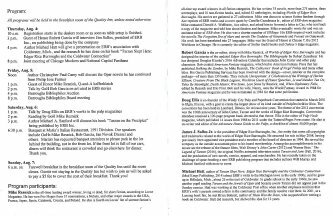 Mention “Burroughs Bibliophiles” when you register. If the block fills early, we can request an increase in the number of rooms in the block. But, remember, the block is gone July 4th.